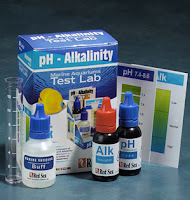 There are different types of Aquarium pH Test Kit, which can be found in aquarium fish stores worldwide. Test kits nowadays are very simple to use and can provide fast and accurate results. Sometimes the usage is as simple as submerging a dipstick to get a reading while others need to compare color measurement with a standard color strip. Let’s look at some of the options available depending on your requirements and budget. Requires addition of a reagent to a measured amount of sample water taken from the tank and the color that appears can be measured and compared against a standard color chart. It is less expensive (in the range of $10 to $20) but it can be hard to read and get the measurement if let’s say the color contract is not clear when compared against the standard. More accurate because all one needs to do is to dip the tip of the reader in the aquarium water and instantaneously the results will appear. This type of reader needs calibration using standard solution and it can be quite expensive to purchase (usually between $70 to $100). However, it might be more economical in the long run because the reader can be reuse again and again for the measurement unlike solutions, which can be depleted. Once you’ve obtained the pH test results, simply adjust accordingly by adding distilled water if the pH goes too high or the other way round, if the pH is too low, you can add in some crushed corals packed in a meshed bag and placed it under the gravel bed or inside aquarium filter media.